Half, One, Two, Three, Four or Five? And please leave her first name. Don't miss out. There's only 5 available and 1 other person has this in their cart right now. Don't miss out. There's only 1 available, and 1 other person has this in their cart right now. We accept paypal, credit cards and Etsy Gift cards. Personalized orders are non refundable after the third day, you always have the option of purchasing a production RUSH if needed. Holiday and personalized items are not eligible for exchange or return unless a mistake was made on our end. We DO NOT refund or exchange sizes that are in excess to the birthday age. For example, if you purchased a size 4/5 for a TWO year old birthday, we will not exchange or refund, use our size chart please. 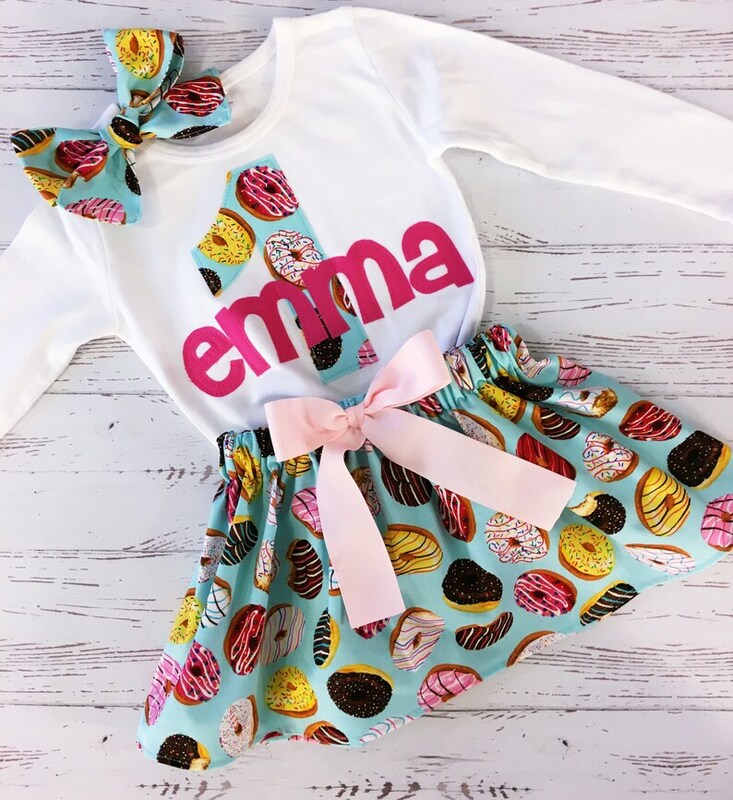 If we sent you the wrong size outfit kindly contact us through Etsy at your earliest convenience and we will do our best to get the correct or new item to you as quickly as we can along with a postage paid envelope for you to return the original merchandise. If we sent you the correct size but it doesn't fit OR If you simply just don't like your outfit you must contact us within three days of delivery in which case you, the Buyer will have to repurchase the original outfit (refundable upon receipt) along with new shipping cost to you and return shipping at a non refundable rate. Once we receive the returned outfit and check that it has not been worn, does not smell of smoke or any other strong odors we will immediately refund the deposit plus refund the original price of the outfit (for returns), any and all shipping cost are non refundable. I sell solely here on Etsy, if you see or purchase my designs copied from another online source I warn you that you are not purchasing my original design nor is anything backed by my return policy. RUSH fees are NON Refundable once an item has shipped. If you have an issue with your order you must let us know within 72 hours of delivery, which we will track through tracking. All shipping can be tracked from your etsy account. We ship only to your Etsy address. If your package shows it's "delivered" by the USPS and you claim nothing has arrived we will not replace your order, an insurance claim with the USPS will need to be placed.